Zoho is launching Zoho docs today at the Office 2.0 conference. 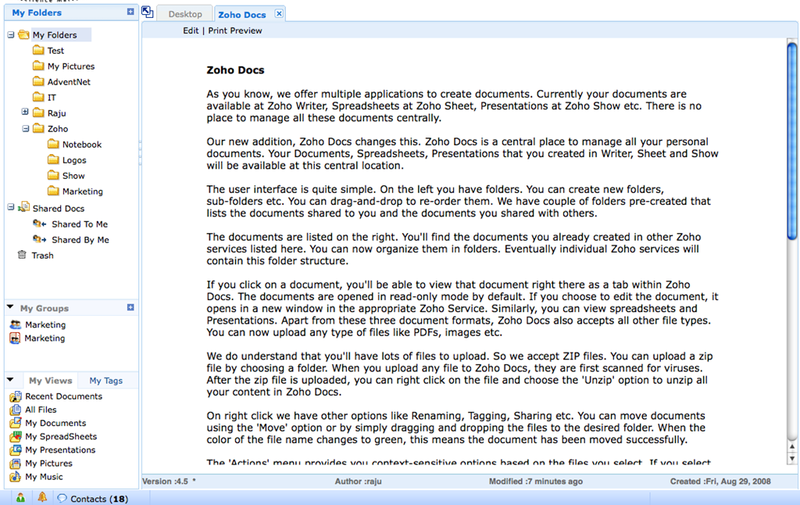 In essence Zoho Docs is a central place to manage all your personal documents. The same way Windows explorer helps manages your desktop files. It’s got all the good drag-and-drop goodness you’d expect from an explorer type product, integrates chat and also supports sharing within groups. I’ve said it often before, and Rod also commented on how Google Chrome helps in this respect, but more and more of the core functionality of the operating system is being disintermediated by browser based offerings – I hate to foretell doom (actually I love to but you get the drift) but repent now operating system makers, for the end is nigh!